Every set, I dedicate a column or two to my mailbag to answer whatever unanswered questions exist about the newest set. It's time for me to answer some questions about Dominaria. I have an allotted word count, which means that there are only so many questions I can get to. Someone else might have asked the same question. I will usually answer the first person who asks. Some questions I either don't know the answer to or don't feel qualified enough in the area to properly answer. Some topics I'm not allowed to answer for all sorts of reasons, including spoilers for future sets. #1 – Are they alive? Dominaria takes place in-world 60 years after Time Spiral, the last time we visited Dominaria (Magic Origins did tell Liliana's origin story on Dominaria, but that was set even further in the past). And remember, many of the characters that showed up in Time Spiral block were pulled there through temporal magic and thus are older than that. A lot of the famous characters of Dominaria are simply no longer alive and thus weren't an option to use. Where we could, we did make new characters that were nods to older characters, descendants and such. #2 – Do they live in any of the places we're visiting? Dominaria is a very big plane. We made the choice to focus on the specific places we were visiting to create some distinct environments through the cards. Some characters were off in places we weren't going (and they had no reason to leave those places), and we knew we would have a chance to see them in a future return. #3 – Are they relevant to the story? Not every legendary creature is relevant to the story, but we did prioritize characters who embodied characteristics that were important either to the story directly or to worldbuilding in locations that were important to the story. #4 – How popular are they? The higher the likelihood that fans would ask to see a character, the better the chance the character had to return. Squee is a great example. He has absolutely nothing to do with the story, but we knew the audience would want to see him, so we included him. #5 – Do they fit into places where we have space? This last category is one that we're always very conscious of, but it's something players often overlook. If the character in question is a white-blue character, for example, and we already have other white-blue characters that take priority, we may not use that character because there simply isn't space for them. We only get so many cards, especially multicolor cards (which legendary creatures are more likely to be), and that means making some tough choices. What all this means is there were a lot of factors that determined who we did and didn't use. Luckily, Dominaria is being received well, and that increases the chance of a return. That would allow us to make a few of the characters we didn't hit this time around. Lots and lots of things. In vision design, I leaned toward more of a smorgasbord approach to the set, where we had a little of everything. But as we built up themes, for both Limited and various Constructed formats, it became clear we had to spend some of the set focusing on themes, which meant that we lost a little space to do the one-ofs. The set still has a lot of that, but there are definitely things missing (Treefolk, Viashino, etc.) that I would have loved to see get at least one card. Remember, originally Dominaria was going to have a small set that went with it, and the plan was to use that to get more of the one-ofs into the block. This is the classic case of trying to solve one problem and backing into a new problem. One of the constraints for our expansion symbols is that they have to be distinct from one another. If a player finds a card and wants to identify what set it's from, it's important that there's only one answer. Dominaria's expansion symbol is a Benalish shield. Magic once before used a shield as an expansion symbol: for the set Darksteel from the original Mirrodin block. The two shields were pretty distinct except when they both appeared in all black. To solve this problem, we decided to use white for common in Dominaria. 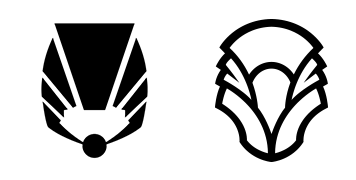 Note that this is not an ongoing change for expansion symbols, just a change for this set. At larger sizes, the common and uncommon expansion symbols felt distinct, but when shrunk down to card size, they ended up being a bit more similar than we anticipated. If you're having a problem distinguishing common from uncommon, the card code at the bottom of the card also tells you the rarity, with "C" meaning common and "U" meaning uncommon (plus "R" for rare and "M" for mythic rare). We've gotten a lot of feedback on this particular issue, and it's been passed along so we can avoid repeating the mistake in the future. Vision Design established that Dominaria was going to have more reprints than a normal set and have them at a higher power level, but the individual choices we made were more for setting the pattern than anything else. Did we try some unexpected reprints? We did. Did Set Design change many of them and try other unexpected reprints? They did. At one point or another we tried a whole host of bold reprints, some of which made it through the process, many of which did not. I'm going to refrain from telling you what we tried because I've learned over the years that telling you something a lot of you would have wanted didn't make the cut leads more to frustration than anything else. Suffice to say, we were pretty bold in the things we tried. I'm interpreting this to mean how long before we know whether something like Sagas or historic can return (to make it a Dominaria-themed question). The answer is pretty quickly. Within a month of the set release, we'll have a pretty good understanding of what was and wasn't received well. A tangential question that is also interesting is, how soon can we reprint a mechanic if we know we want to do it again? There's two answers. First is the aggressive approach. Oftentimes, we will play with something and like it so much that we'll make the bold choice to bring it back before we definitively know what you all think of it. Vehicles and prowess are both examples of us doing that. Second is the more cautious approach. This one requires us to wait and see the reaction from the audience (as I said above, that doesn't take long). As we work between two and three years ahead, this means that the mechanic won't see a return for a least that much time. And that's if we immediately want to bring it back. More likely, if it's a success, it goes onto the list of things we'd like to bring back and we wait until we find the right place to use it. This means a return could take anywhere from two years to ten-plus. As a general rule of thumb, non-deciduous mechanics usually aren't repeated for at least five years (although that's a rule we break on occasion). Sagas and historic are each different from a normal mechanic, though. Sagas are an enchantment subtype rather than a new mechanic, strictly speaking. If they're popular, they could, in theory, become deciduous, meaning they could be a tool that any set has access to. Historic's success would most likely be seen with us using the "batching" technology that it premiered. I believe it would be more likely for you to see us batch new things together with a different flavor before you saw the return of historic itself. Not-serious answer: Shh, don't let it know we're aware of it. Serious answer: It's a very low-powered card. It's a C according to the way we grade cards for Limited. We've been moving away from having too many C cards in sets, as they tend to be duds for drafting and just lead to more repetition in deck building and gameplay. We talked specifically about Storm Crow, about whether the joke of it being in the set was worth the hit to Limited play, and we decided it wasn't. The plan was always to do just one cycle of them (they were made in early set design, and a sixth multicolor one got added later), and they leaned toward wanting to be big, expensive, splashy spells, which tends to be more of a sorcery thing than an instant thing. The reason they tend to be bigger is not just for splash but also to increase the chance that you'll have a legendary creature or planeswalker on the battlefield by the time you want to cast it. Also, when we do cycles like this, we tend to make them functionally similar so players are less likely to get confused about how they work and to make the cycle more cohesive. (Four and one, where four cards in a cycle work one way and one works differently, tends to grate on some players. We do it occasionally, but only where there's a very strong reason.) Legendary instants work just fine within the rules, and if legendary sorceries prove popular, it's something we might try one day, perhaps on a return to Dominaria. I've now known Richard for almost 25 years, so I've gotten a bit past the "star-struck" phase. I did go through it when I first met him, though. Interestingly, most of the other members of the design team (everyone but Aaron) had either never met Richard before or had very little interaction with him, so many of them were a bit star-struck at first. But design requires us to spend a lot of time together and talk a lot, so they all quickly got to the point where Richard was just another member of the team. I have no problem telling Richard "no" when I need to. This was mostly us trying to make Jaya's planeswalker card feel distinct from Chandra's many planeswalker cards. Chandra has kind of cornered damage-dealing as her signature thing, so we looked for different ways to make a pyromancer planeswalker. The idea with Jaya is that all the instants and sorceries you're casting are direct-damage spells, so she is helping you shoot fire—just a little differently than Chandra does. The biggest limitation we have with giving planes depth is that we only have so much time to create each one. The way we give planes extensive depth is mostly by revisiting them, because with each trip we get to layer new material onto them. Dominaria made perfect sense as the "history plane" because it's the plane we've revisited more than every other plane by a huge factor. Counting Rath, which has been overlaid onto Dominaria, there are over 30 sets that took place on Dominaria. I believe Ravnica and Mirrodin, at six apiece, are tied for second place (and Mirrodin has essentially become a different plane). What this means is making Dominaria the "history plane" isn't really giving anything up. Even if we revisit Ravnica on a regular basis, it would be many decades before it could catch up to Dominaria (and that assumes we stop going back to Dominaria). In short, we will try to give other planes as much depth as we can, but the sheer nature of what it takes to make worlds means no other plane is realistically ever catching up to Dominaria. Our goal with Dominaria was to capture the cool elements of the plane and the early years of Magic, but through the lens of modern design. We didn't want the set playing like early Magic, but rather capturing the visceral sense of early Magic. Having Richard on the design team did a lot to help us figure out which components worked in that regard and which didn't. One of the things every designer does is look back at their early work and think about how they would do it now, given all they've learned and the technology that's available. A lot of the talks with Richard were about what things he did out of necessity at the time versus designing with intent. A great example of this issue boiled down to a single card: Lich's Mastery. In Limited Edition (Alpha), Richard created the card Lich. Lich was created because Richard wanted to bring to life the concept of a lich, a powerful sorcerer who has gained immortality through reanimating their own corpse. Richard never felt the original Lich lived up to its vision mechanically, so in Dominaria, he was able to go back and try to recapture the idea again. A lot of Dominaria design follows this model of us finding cool elements from Dominaria that we could recreate through modern Magic design technology. Having Richard as the embodiment of that vision proved very useful in this task. Lots and lots of it. In fact, when the set code named "Salad" turned into a core set, a large piece of the story, hinging on one of the many narrative threads of the plane, had to get removed. Dominaria has so much history baked into it that there was simply no way for us to hit it all in one set, and much of the stuff we do reference we just tease. When (not if—I'm confident Dominaria is going to be a success) we return to Dominaria (and I'm optimistic it will be many times), we have a treasure trove of stories and historical material to play with. 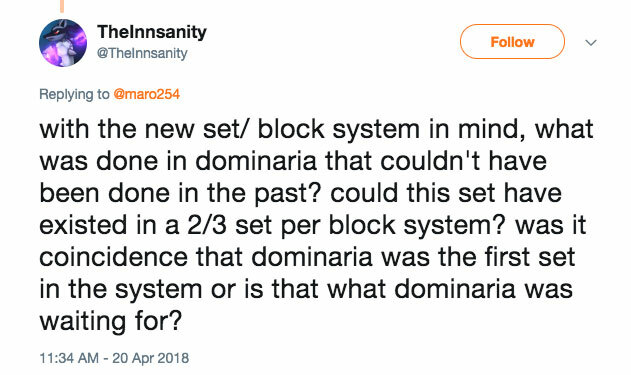 Dominaria being the first set in the three-and-one world (three large sets and a core set each year) is coincidence and not the cause of the change. Dominaria is a world I feel very confident could have worked under the old system, as either a three-set block or a two-set block. The change was the result of many things that occurred over the last few years. Dominaria was the first set to go through vision design solely because it was the next set in the lineup. Don't have too low of an "as-fan" (aka how often your theme shows up per booster). Champions of Kamigawa is where my famous line "If your theme isn't at common, it's not your theme" came from. The fact that the theme lived primarily at rare meant it just wasn't easily identifiable and was almost nonexistent in Limited. Dominaria took this lesson to heart, and it's a big part of why historic and the "one legendary creature per booster" collation were so crucial to making the set work. Be careful how you use uncommon legendary creatures. Champions of Kamigawa block had some uncommon legendary creatures, but they were too few in number and too simplistic in design. Part of making your theme work is pulling some rares down into uncommon slots, allowing a greater depth of play with your theme. Make your legendary enablers have a functionality outside the theme. Champions of Kamigawa block had too many cards that only worked if you had enough legendary creatures. Dominaria has cards, especially at lower rarities, that get enhanced when interacting with legendary cards, usually creatures, but don't require them. Don't have your legendary theme disconnected from your other themes. Champions of Kamigawa block had other mechanical themes, but for the most part, they didn't do a good job of interweaving with the legendary theme. Dominaria, by contrast, uses all its other mechanics to help create synergies with the theme, so the whole set is working to make that theme sing. I often talk about how failure is a good teacher. In this case, it was an excellent one. Not everything in a successful set is good and not everything in an unsuccessful set is bad. The trick, as I mentioned above, is figuring out how to take a theme that we know has the potential to be popular (and remember, when Champions of Kamigawa came out, Commander was just in its infancy as a format) and using a modern design sensibility to make it work. A big part of that for Dominaria was expanding the theme to include more than just legendary things by using historic, which allowed us to bring in other components to make the theme work. I've run out of time for today, but I have a whole lot of questions left, which means I'll be answering more of your questions next week. As always, I'm eager for your feedback on any of the answers I've given today. You can email me or contact me through any of my social media accounts (Twitter, Tumblr, Google+, and Instagram). Until then, may you play a lot of Dominaria to come up with more questions. A lot of my job is giving and receiving criticism. In this podcast, I talk about the tenets to giving criticism in a way that helps the person getting the criticism be better able to use it. This podcast is another in my "Lessons Learned" series where I talk about the lessons I learned on sets for which I led or co-led the design. In this podcast, I talk about co-leading Amonkhet.